The Tailgate Test Kit quickly and easily identifies flocculants that reduce turbidity in construction stormwater discharge. The mobile test setup efficiently determines which of the many available products works best for a particular construction site. In this study, 13 product combinations were tested. A short list of five tests was developed, as well as worksheets to aid in calculating the amount of flocculant needed and developing scale-up procedures. “The Tailgate Test Kit is a cost-effective innovation that will help us determine the flocculant and quantity of product to use in the field and in real time,” said Dwayne Stenlund, Natural Resources Program Coordinator, MnDOT Environmental Stewardship. Stormwater runoff from construction sites often carries sediment from soil erosion, causing the water to become cloudy or turbid. Federal, state and local stormwater regulations prohibit construction sites from discharging water that is too turbid into the environment. Instead, the runoff must be sent to ponds to allow the sediment to settle to the bottom of the pond. The remaining clear effluent may then be discharged from the site. Testing stormwater sediment levels at the construction site allows field crews to begin treating turbid water quickly. The chemicals in flocculants speed up the sediment settling process by causing the sediment particles to clump together and fall to the bottom more rapidly. A number of flocculating agents are commercially available. The most effective agent for a specific situation is generally deter-mined by testing various flocculants with water samples in a lab. This selection process usually takes one or two days. Only after the appropriate flocculant is selected can the entire pond be treated. To speed up this process, MnDOT has developed the Tailgate Test Kit, a series of tests that can be conducted in the field to determine the most effective flocculant, as well as the correct amount, for a specific construction site and soil type. What used to take a day or two to process in the lab now can be accomplished by field crews in an hour or two on the tailgate of a truck, enabling workers to begin treating the ponded turbid water much more quickly. 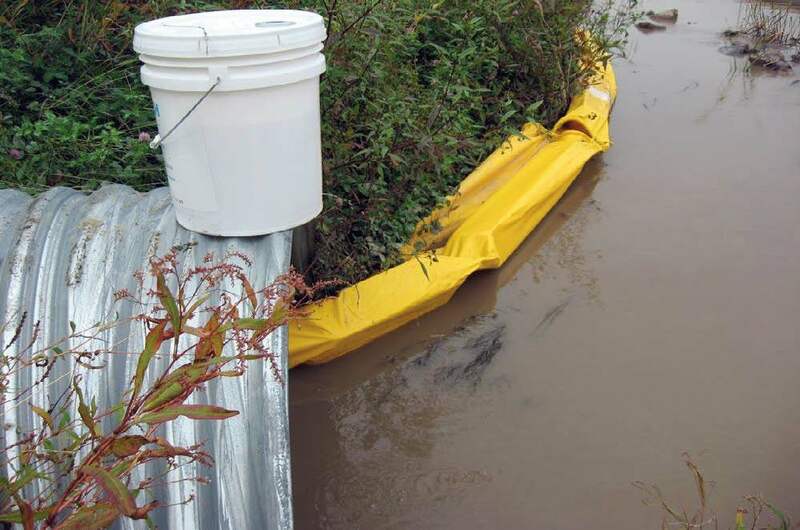 The overall goal of this study was to build upon the findings of several recent research projects, including “Flocculation Treatment BMPs for Construction Water Discharges” (2014-25), by developing and improving field methods to reduce total suspended sediment from construction stormwater runoff. A specific aim was to create a method for work crews to test water samples in the field using a mobile test toolkit that contains flocculants identified in previous research. Other goals included determining the most effective amount of the flocculant needed, developing the calculations needed for scale-up once the best product is identified and implementing a test for residual unreacted product. To identify a variety of flocculant product types to evaluate with the Tailgate Test Kit, the research team summarized stormwater best management practices from the literature and from other departments of transportation. Since the effectiveness of product types varies depending upon soil and sediment types and environmental conditions, researchers conducted 13 tests of nine flocculant products (alone and in combination) taken from five distinct product classifications: mineral, polyacrylamide, chitosan, bio-polymer and anionic polyacrylamide. They also tested water samples from eight locations in Minnesota to ensure a cross section of representative samples. Using the results from these tests, the research team developed a short list of five tests that could be conducted in the field and incorporated in the Tailgate Test Kit. The five tests represent a range of flocculant product classifications and reduce the time required to complete the tests. The team also prepared worksheets with mixing and dosing guidance to help users identify the most effective amount of product to achieve the target turbidity goal. Finally, the team developed scale-up procedures to aid in using test results to determine full-scale dosing rates on-site and procedures for testing new flocculant products. The researchers investigated four methods for testing residual flocculant to detect any unreacted product in a sample. A preferred method was not identified during the course of this research but would still be a desirable research outcome. Next steps for this research effort include field implementation and new product evaluation. First, investigators recommend developing a training module and field guide for using the Tailgate Test Kit to encourage implementation of the mobile kit throughout the state. If users understand how it works and how to use the test results for scale-up calculations, they will be more likely to use it. Second, the product list should be kept current by testing additional flocculant products. It may also be beneficial to create a category for flocculants on the MnDOT Approved/Qualified Products List. Finally, methods to identify residual and unreacted flocculant product need to be developed. If excess flocculant product is used in field tests, the residues will eventually have to be collected and removed for disposal. Minimizing the excess flocculant used at construction sites is desirable. This post pertains to Report 2017-32, “Tailgate Test Kit for Determining Appropriate Sediment Reducing Chemicals and Dose Rates,” published July 2017. The new guidebook provides eight cost‐effective stabilization techniques that local government engineers can undertake to stabilize slopes using local materials and equipment. “When most studies end, further research is needed. This project, however, created a user guide that local engineers can use right away to repair destabilized slopes,” said Blake Nelson, Geotechnologies Engineer, MnDOT Office of Materials and Road Research. “This guide includes an easy-to-use flowchart that steers local engineers toward an appropriate slope stabilization technique,” said David Saftner, Assistant Professor, University of Minnesota Duluth Department of Civil Engineering. Winter weather and spring storms leave their mark on slopes along highways and at bridges. Erosion and other forces cut gashes and ravines into slopes. Some damage such as failing pavement at shoulders or sloughed off sections of a slope can be obvious to road users. Other, more subtle signs of creeping embankments may only catch the attention of engineers. Slope failures must be repaired to prevent damage to roadways and embankments. When slope damage is severe, a geotechnical engineering firm must step in at some expense. By the time the first soil sample bore is pulled, county engineering departments may already be facing a bill of $20,000. But when damage is less severe, the county can often stabilize the slope using local materials and simple techniques. Determining whether slope damage can be completed by local engineers or requires outside help remains a challenge for county road departments that often lack geotechnical expertise. The Local Road Research Board (LRRB) funded a research project to determine effective methods for stabilizing damaged roadway slopes. These methods would be incorporated in a guide that local engineers could use to identify the type of slope failure and then select an appropriate repair method. Investigators began by surveying Minnesota county engineering departments to identify sites that needed to be stabilized. Local engineers also provided details about both successful and unsuccessful stabilization methods that have been tried in the past. The re-search team inspected 14 destabilized sites identified in this effort and took soil samples from each site. Then they conducted a literature review of slope stabilization methods, identifying 12 stabilization techniques. Based on this review, researchers tested the soil samples with direct shear tests to identify shear strength parameters such as effective friction angle and cohesion. They ran soil classification tests to measure plasticity, granularity and gradation, and moisture content. These properties were then used as inputs in slope modeling and parametric studies to examine viable repair techniques for each site. Investigators summarized their analysis of each case and documented stabilization methods that would meet the needs identified in the case studies. Finally, the research team prepared a slope stabilization guide that local engineers could use in the field to identify the type of slope failure and the appropriate solution. Five of the destabilized sites featured primarily sandy soil, eight had fine-grained soil, and one was rocky. Slope failure was visible at nine of the sites. Groundwater management figured prominently in most sites and repairs. The literature search identified approaches for specific types of failures. Managing groundwater and drainage improves shear strength in slide-prone areas; surface covers protect slopes from erosion; vegetation and plant roots stabilize soil; excavation and regrading reduce failure forces; and structural reinforcement features directly support slope materials. Investigators identified eight slope failure mechanisms that encompassed the full range of destabilization scenarios presented in the case studies. Each method had been identified in survey responses as a technique used successfully at the local level. The site conditions that contributed to the failure were identified along with a repair solution for each failure type. Using the findings from this project, researchers created a slope stabilization guide for Minnesota local government engineers. This field guide describes common slope failures and conditions that may contribute to each. It includes a simple, three-step flowchart that guides engineers to the appropriate repair technique by determining whether the damage is a creep or rotational failure, whether the soil is cohesive or granular, and if there are groundwater concerns. Based on engineers’ answers, the flowchart directs them to one or more of the eight slope stabilization techniques, providing photographs and repair methods that have been successful in addressing slope problems along Minnesota roadways. The Slope Stabilization Guide for Minnesota Local Government Engineers will be sent to each of the 87 county engineering departments. Local engineers can keep the guide on hand when they investigate slope failures along their roadways, and with it quickly identify what work needs to be done to repair the damage. This project dovetails with two ongoing MnDOT research efforts, Slope Failure Risk Analysis and MnDOT Slope Vulnerability Assessments. For more related research, see the Protecting Roads From Flood Damage page on the MnDOT Research Services website. This post pertains to the LRRB-produced Report 2017-17, “Slope Stabilization and Repair Solutions for Local Government Engineers,” and Report 2017-17G, “Slope Stabilization Guide for Minnesota Local Government Engineers,” both published June 2017. The same chemicals used to treat drinking water might now be able to treat stormwater runoff to reduce the amount of pollutants entering Minnesota lakes and rivers from road construction sites. A research project headed by Mankato State University and funded by the Minnesota Department of Transportation has identified three chemical flocculants that are effective at removing a broad range of Minnesota soils from water. Adding flocculant to a sample of water from the Minnesota River causes sediment to clump and sink. Recent MnDOT research has investigated monitoring the amount of sediment in stormwater runoff and using temporary ponds to let sediment settle out of stormwater before it runs off the construction site. MnDOT also wanted to examine the possibility of treating construction runoff with flocculants, which are chemicals that cause suspended sediment to form clumps that quickly settle out of the solution. Researchers tested 21 chemicals to see how well they could remove 57 types of soil from water. While no chemical was effective for the entire range of Minnesota’s soils, three chemicals were broadly effective on a range of samples. The research will contribute to improved treatment of stormwater runoff from construction sites and reduce the amount of sediment pollution entering the state’s rivers and lakes. 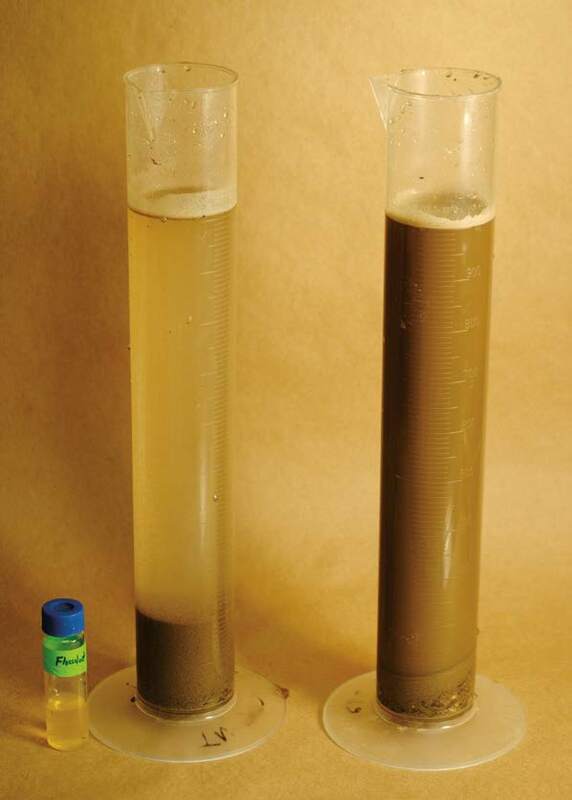 Although flocculants have been used to treat drinking water for seven decades, there has been only limited testing of their use in treating construction runoff. Research was needed to evaluate the effectiveness of this approach. chemical and mounting it above the water (as shown here), although thorough mixing must be ensured. MnDOT hopes to develop a system that will automatically dispense a precise dose based on the amount of sediment in the water. Since it is not feasible for workers to constantly monitor sediment concentration in stormwater runoff, MnDOT hopes to leverage the knowledge gained from this project to develop an automated system that measures the amount of sediment in runoff and automatically adds the appropriate dose of flocculant to treat the water. “We’re trying to develop a portable water treatment plant that can be applied to construction projects to deliver clean runoff water after a storm,” said MnDOT Environmental Specialist Dwayne Stenlund. Any chemicals recommended for field usage will need to be approved by the Minnesota Pollution Control Agency, and methods for disposing of used chemicals will need to be identified as the environmental impacts of residual chemicals are unknown. *Editor’s note: This article was adapted from the September-October 2014 issue of our Accelerator newsletter. Read it online or sign up for your free subscription. The Topeka shiner, a small minnow that inhabits slow-moving prairie streams, was once widespread and abundant in portions of Iowa, Kansas, Minnesota, Missouri, Nebraska and South Dakota. It now inhabits less than 10 percent of its original geographic range. 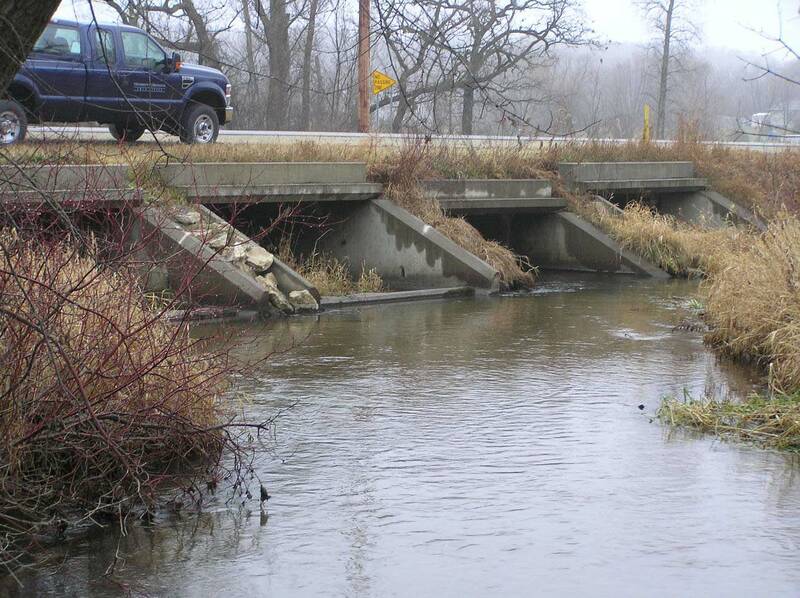 In a new study funded by the Minnesota Department of Transportation, engineers are trying to ensure that new culverts do not degrade the habitat of an endangered fish in southern Minnesota. The state has already researched how to better accommodate fish passage at river and stream crossings. Now it is looking at design guidelines for culverts that specifically impact the Topeka shiner, a small endangered fish found in five Midwestern states. In Minnesota, the Topeka shiner is known to live in at least 57 streams, totaling 605 miles, within the Big Sioux and Rock River watersheds. “The Topeka shiner is reported to have been erased from about 50 percent of its historic range in Iowa and much of its range in Minnesota, which is why Minnesota is so intent on doing what it can to help this fish thrive here,” said Alan Rindels, MnDOT’s project coordinator for the research. 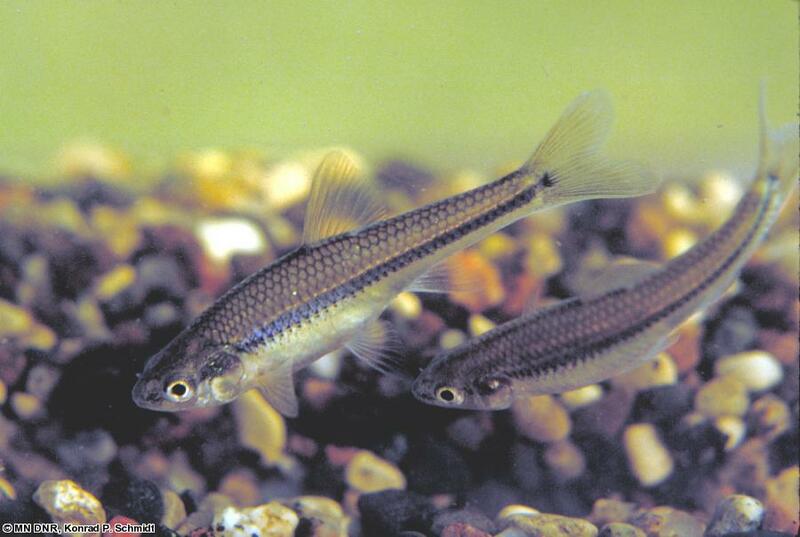 The Topeka shiner is endangered due to the degradation of stream habitat, stream channelization, non-native predatory fishes and construction within waterways. Culverts might impede the passage of this small minnow for a number of reasons, including that they might be too long, lack sufficient depth or carry water too fast. Culverts (also called small bridges) allow water to pass under roads. Occasionally, they can harm a stream’s fish habitat by inadvertently acting as a barrier to fish passage or migration. On the West Coast, large-scale efforts are under way to protect migratory salmon, and in Minnesota, culvert designers are concerned about fresh water species. In addition, long culverts block sunlight, which possibly discourages fish from swimming through. Typically, older culverts are replaced with longer culverts to improve road safety and minimize maintenance costs. To eliminate or minimize impacts to the Topeka shiner, the state is trying to determine if light mitigation strategies are necessary. Researchers from the University of Minnesota’s St. Anthony Falls Research Laboratory will monitor a newly installed culvert (110 feet in length) and a few other culverts in critical Topeka shiner habitat streams during spawning and fall movement. Additionally, a laboratory-based light manipulation experiment will examine the behavior of the warm-water fish when presented with a dark culvert. Guidelines for culvert design in Topeka shiner habitat will be developed based on these results, as well as examples from neighboring states. The state is also collaborating with the U.S. Fish and Wildlife Service and affected Minnesota counties.